How to take screenshot on Moto E? How to enable and access Moto E developer options? How to manage files on Moto E with ES File Explorer File Manager? How to customize Moto E ringtones? How to use Moto E keyboard? How to connect Moto E with PC through USB cable? How to use Bluetooth to transfer files on Moto E? How to use FM radio on Moto E? How to block certain callers on Moto E ? How to use Moto E safe mode? Which Moto E is for you: Moto E4 or Moto E4 Plus? You can get the answer here. Motorola announced two latest Moto E family products: Moto E4 and Moto E4 Plus in June 12. This post summarizes the major differences between Moto E4 and Moto E4 Plus. Both Moto E4 and Moto E4 Plus share similar design and build quality. But the difference between these two phones is substantial. Hopefully, the comparison of Moto E4 and Moto E4 Plus will help you to decide which phone is for you. Please note some features, e.g., dual SIM feature and CPU (Snapdragon 425/427 for North America and Mediatek MT6737 for other regions), are region-specific. We do not consider such differences in this post as such features are not options for users. Moto E4 Plus is far bigger and heavy than Moto E4. The screen size of Moto E4 is 5″, while Moto E4 Plus 5.5″. But the screen resolution is identical at 720p (1280*720). This means Moto E4 has a higher pixel density (294ppi vs 267ppi). Same photos in Moto G4 may look sharper than in Moto E4 Plus. Moto E4 Plus is about 31% heavier than Moto E4 (198g vs 151g). One of the major differences between these two phones is the battery. Moto E4 has a removable battery with a capacity of 2800mAH. Moto E4 Plus has a non-removable battery with an eye-poping capacity of 5000mAH, which is comparable to many battery packs in the market. This means Moto E4 Plus should have far longer battery life than Moto E4 although it has a larger display. Motorola claimed Moto E4 Plus battery can last two days for most users. In addition, Moto E4 Plus charges faster. It supports 1oW fast charging; while Moto E4 only supports 5W charging. Unfortunately, Motorola does not offer powerbank option for Moto E4 Plus. You probably cannot use the 5000mAH battery to charge other devices directly through the micro USB port. The rear camera in Moto E4 and E4 Plus is also substantially different. 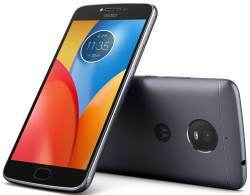 Moto E4 Plus has a 13MP rear camera with f/2.0 sensor; while Moto E4 has only 8MP f/2.2 camera sensor. The front camera in two phones are identical. And interestingly, both phones offer LED flash for the front camera. Most high-end smartphones even do not have this feature. As a budget phone, Motorola is generous enough to pack 2GB RAM in Moto E4. This is sufficiently for daily use (except heavy games). For Moto E4 Plus, 3GB RAM can be found in the international version. But in US version, the memory is only 2GB. This is probably due to slightly higher price of Snapdragon chip used in US version. Of course, Moto E4 Plus is more expensive. The suggested price for Moto E4 Plus is $179.99 and $129.99 for Moto E4. Can I use micro SD card in Moto E4 and Moto E4 Plus? Yes, both Moto E4 and E4 Plus have a dedicated micro SD card slot. You can use micro SD card as either internal storage or portable storage. Does Moto E4 or Moto E4 Plus have a fingerprint reader to unlock the phone? Both Moto E4 and Moto E4 Plus have a front fingerprint reader. Which phone supports dual SIM cards: Moto E4 or Moto E4 Plus? Dual SIM versions are offered in most international markets for both Moto E4 and Moto E4 Plus. But in US, both Moto E4 and Moto E4 Plus support only one SIM card. So, it depends on your region whether the Moto E4 and Moto E4 Plus are dual SIM. Please note, dual SIM version of Moto E4 and Moto E4 Plus are dual standby only. What’s your thoughts on Moto E4 vs Moto E4 Plus? Do you have any questions on differences between Moto E4 and Moto E4 Plus? If you have any questions on Moto E4 vs Moto E4 Plus or want to share your thoughts on differences between Moto E4 and Moto E4 Plus, please let us know in the comment box below. The community will try to help you and you will help the Moto E owners community. For more Moto E guides, please check this Moto E how-to guides page. hello, they have some diference in the buttons place? a case for moto e4 plus will work on a moto e4? The size is different. Moto E4 plus is a 5.5 inch phone and Moto E4 is 5 inch. You cannot interchange the case for these two phones. You need bought a specific case for E4 or for E4 plus. NEW!! Facebook page || Moto G How-to guides || Android Guides || Chromecast Guides || Galaxy S6 Guides || Galaxy S7 Guides || Galaxy S8 Guides || Galaxy S9 Guides || Google Home Guides . I have question actually… It’s have vr support on e4plus..?? If you are referring to Daydream, no, Moto E4/E4 Plus does not support it. Daydream requires AMOLED display and more powerful hardware. But if you are referring to Google cardboard (or Google cardboard compatible VR headset like View-Master), yes, it should work. IS THERE A SEPARATE SD CARD SLOT FOR MOTOE4 RATHER THAN 2 SIM PORTS…..OR ELSE IT S A HYBRID? Moto E4 and E4 plus have a dedicated SD card slot. So for dual SIM versions, you can use two sim cards AND a micro SD card. My E4 refuses to dd group texting and send photos attached to a text. The phone keeps saying “sending” then eventually “message not sent”. Help? Can you send messages individually? The attaching photo issue is related to MMS settings. You should contact your carrier for the correct message center settings and APN for MMS. Yes, individual texting is fine as long as I don’t attach a photo or sticker. Emojis are fine, though. Then it’s very likely caused by some problems in your MMS (messages with pictures or audio) settings. You need to check with the carrier for the correct settings for MMS. Normally, they will send you a message, you then apply it. Please note, MMS always use mobile data collection even when WiFi is available. You can try to turn on mobile data to try MMS. Emojis are sent as text, not MMS.